ConceptDraw DIAGRAM extended with Fire and Emergency Plans solution from the Building Plans area of ConceptDraw Solution Park lets you make a Fire Exit Plan of any complexity in minutes. The simplest way of Fire Exit Plan creating is to open the ConceptDraw STORE and to choose one of the offered by Fire and Emergency Plans Solution templates or samples. Then you can simply make some change in it according to your premises plan and fire-fighting equipment layout. Fire and Emergency Plans Solution includes wide variety of different samples and we hope you will find the desired for you. Designing a Fire Exit Plan use also ready vector objects offered by Fire and Emergency Planning library from Fire and Emergency Plans Solution. 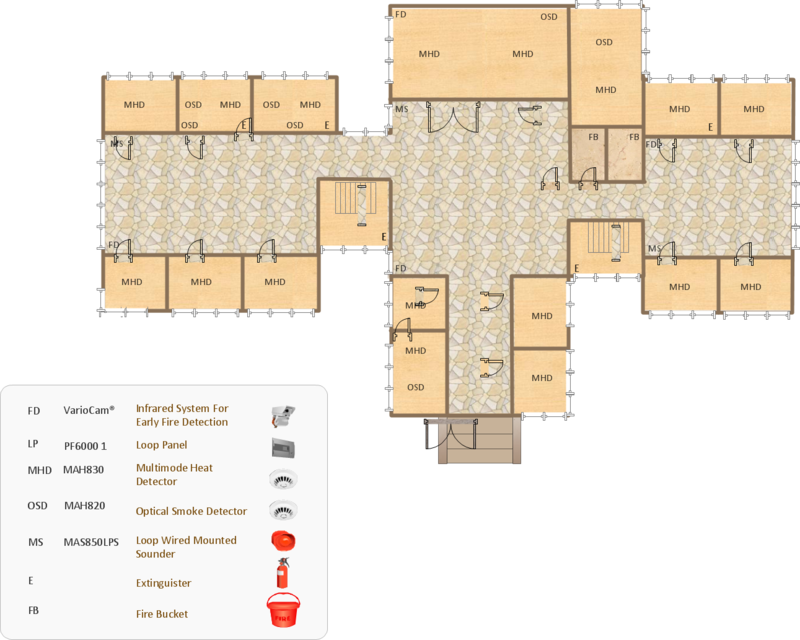 The samples you see on this page were created in ConceptDraw DIAGRAM using the tools of Fire and Emergency Plans Solution from Building Plans Area. An experienced user spent 15 minutes creating every of them. 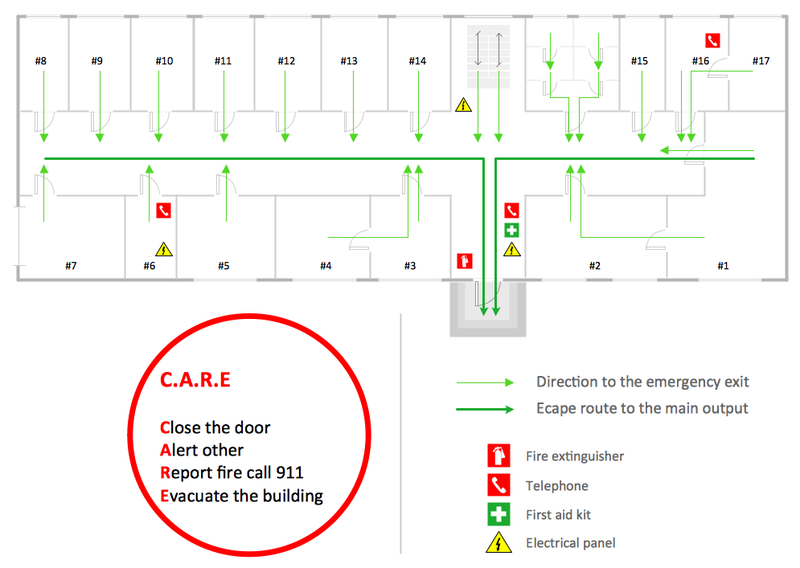 Use the Fire and Emergency Plans Solution for ConceptDraw DIAGRAM to create quick and easy your own professional looking and visible for everyone Fire Exit Plan. The Fire Exit Plan designed with ConceptDraw DIAGRAM is vector graphic documents and is available for reviewing, modifying, converting to a variety of formats (image, HTML, PDF file, MS PowerPoint Presentation, Adobe Flash or MS Visio), printing and send via e-mail in one moment. Have you ever created the fire plans on the base of Fire Evacuation Plan Template? It's incredibly convenient and time-saving way. Let's try to make sure this with Fire and Emergency Plans solution from the Building Plans Area for ConceptDraw DIAGRAM v12 software. ConceptDraw DIAGRAM v12 diagramming and vector drawing software is the best choice for making professional looking Emergency Plan template, examples and samples. 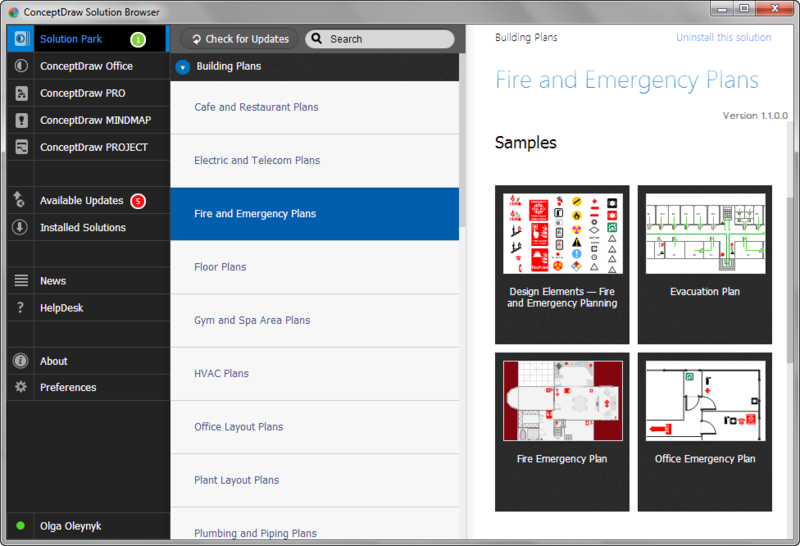 ConceptDraw DIAGRAM v12 provides Fire and Emergency Plans solution from the Building Plans Area of ConceptDraw Solution Park. For create port terminal plans use the appropriate stencils from shipping and receiving library. In the case of origin of an emergency is very important to have a correct, clear and comprehensible action plan which will help you to react quicker and to make right decisions. ConceptDraw DIAGRAM v12 software extended with Fire and Emergency Plans solution from the Building Plans Area of ConceptDraw Solution Park provides extensive drawing tools for quick and easy creating fire and emergency plans, and also a set of various templates and samples, among them the Emergency Action Plan Template.